On Saturday the 12th of August, the Sander family from Plevna, MT was fishing at Fort Peck after salmon. Carson had hooked up a silver and dark green spoon, and we just moved over to the mouth of Duck Creek and set up. We were traveling at a speed of 1.8 mph and a depth of 112 feet when Carson had a bite! 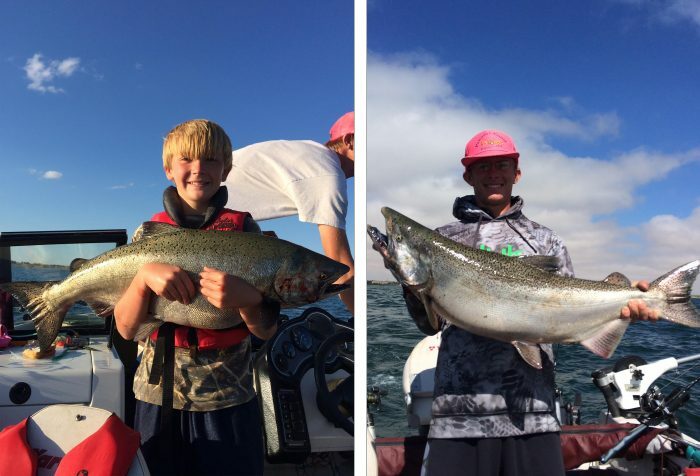 He set the hook and started reeling, with the help from his older brother Dylan, and landed his biggest fish–a 20lb salmon! Then, on Sunday the 13th, Dylan was using a purple squid at a speed of 2.0 mph and a depth of 100 feet, and HE got a bite! Dylan set the hook and landed a nice 22.5 lb salmon! Dylan’s fish was caught out from Fort Peck Marina, heading towards the dam.